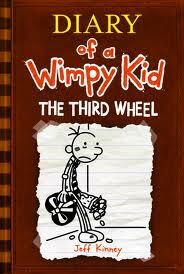 It took me a while to get the most recent Diary of a Wimpy Kid book. Our school's copies are pre-reserved until the end of time, and there aren't a ton of copies floating around Bogota. Still, I borrowed a student's book and devoured it in a few hours. Greg has grown up a little and has begun to navigate the wilds of Valentine's dances and asking girls on dates. I particularly enjoyed this aspect of the book because I had 540 roses delivered to my house this week for the Student Council to sell; I got a front row seat to the drama surrounding this holiday. Demonstrating his typical logic, Greg gets romantic advice from his uncle who has been divorced four times. He also forces the clueless Rowley to be his wingman. I've seen many similarly terrible decisions this week. A few of my students complained that this series seems to be repeating itself. I don't completely disagree, but am thrilled that they are ready to move on to more complex novels. In the meantime, I'm grateful for another installment of Greg's misadventures to discuss with the developing readers who enter my class each year.